During qualifying for yesterdays Hungarian GP Felipe Massa was unlucky enough to catch a one pound spring off of Ruebens Barichello's Brawn while traveling close to 170 mph. He was kept in an induced coma for two days but it sounds like as of Monday he is awake and responding favorably. They still are unsure of the damage that he may have taken to his eye. Jalopnik has a picture of his helmet and an embedded video here. Watch the video quickly because F1 is pretty quick about getting videos pulled. Basically that spring had been bouncing on the track for four seconds before Massa hit it. Just about any other piece of a car except a wheel would have settled on the ground and been only a hazard to the car (puncture, broken body work). The odds of his head and the spring being at the same point at that moment are huge, but it happened. From the picture on Jalopnik, it looks like Massa was very close to being hit directly through his visor. We are talking another inch and almost certain death. This incident is remarkably similar to the incident that killed Henry Surtees, the son of former F1 champion, John Surtees. He was hit in the head by a wheel that had broken away from another car. 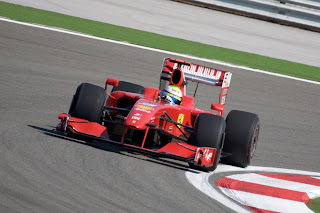 Massa has been the driver I love to root against ever since he put on the Ferrari red. But you never want this. Hopefully we will see him flying around the track in that Ferrari again. I will definitely be cheering loudly for him.